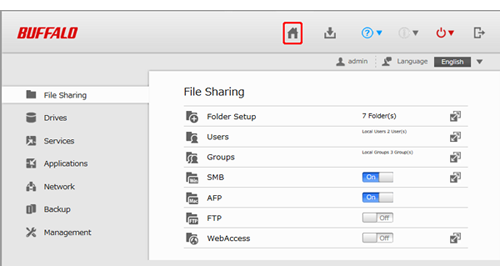 LinkStation 400 - How to Open Settings - Details of an answer | Buffalo Inc.
Configure and administer your LinkStation using the settings interface, accessible from a browser window. 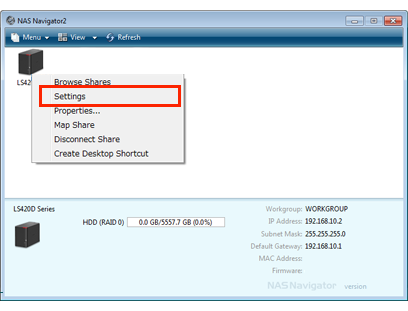 Open the interface using the procedure below or type the LinkStation's IP address in the URL field of your browser. Use the Easy Admin page to make common changes to basic settings. For a PC, double-click the icon. For Mac OS, click the icon in the Dock. Right-click on your LinkStation's icon and choose [Settings]. For Mac OS, click the LinkStation icon while holding down the control key, then select [Settings]. 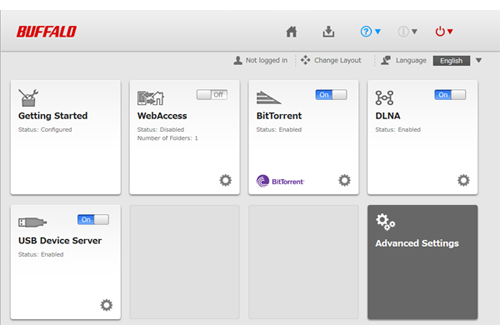 The Easy Admin screen will open. • If you click any buttons, you will need to enter a username and password. LinkStation's name, IP address, workgroup, drive status, firmware version, and your password. • If the time-out period is set to "10 minutes", you will be logged out of Settings after 10 minutes of inactivity. You will also be logged out when you reboot the LinkStation or close the web browser, even if you select "Unlimited". • Click [Secure Connection] to secure your login. • You can also use Bonjour to log in to Settings on Mac OS. In Safari, click [View]- [Show Bookmarks Bar]. From Bookmarks, click [Bonjour] - [LinkStation name]. 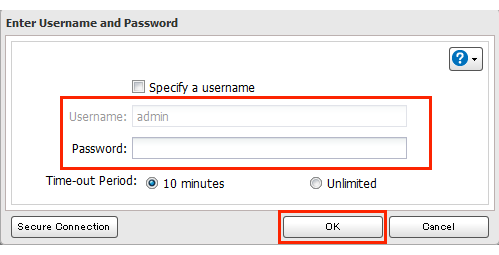 Click [Advanced Settings] in Easy Admin. 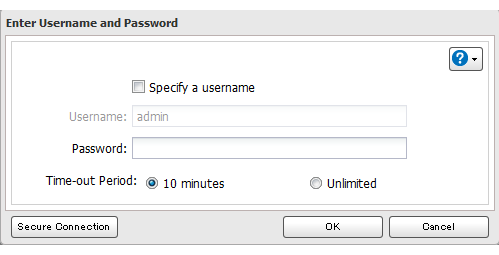 Enter the administrator username and password, then click [OK]. 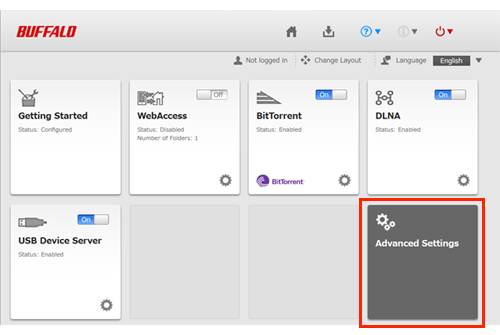 The Advanced Settings screen will open. To go back to Easy Admin, click the Home icon. Internet Explorer 9, Firefox 18, Google Chrome 24, Safari 5, and later are supported. • If there are a large number of registered users, groups, or shared folders, use Firefox 18 or later instead of Internet Explorer. • If you have a proxy server enabled in the browser settings, disable the proxy server. • With Internet Explorer, set security to "Local intranet". On Windows Server 2012 or Windows Server 2008, higher-level security is configured. Set the security to a lower level temporarily.